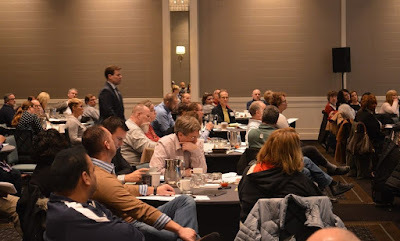 IASB’s Spring Division Meetings will offer a variety of topics of interest to local boards of education, as well as networking opportunities and updates from Association staff and division representatives. This series of meetings also includes Candidate Briefings, which will provide school board candidates with an overview of the roles and responsibilities of an elected school board member and an idea of what to expect if they are successful in the April elections. Online registration is required and can be completed through IASB’s “My Account” button at iasb.com. Attendance at Division Meetings earns participants five points in IASB’s Master Board Member Program. The sponsors for Spring Division Meetings are below. Click here for a list of dates and programming. The deadline for school districts to announce their intent to switch from half-day to full-day kindergarten is March 1. Under changes enacted by the Evidence-Based Funding (EBF) formula, school dollars are distributed based on total average student enrollment, among other factors. Kindergarten students who attend half-day programs are assigned a value of .5, while full-day students are assigned a value of 1.0. For schools with half-day programs, making the change will convert kindergarten attendance to full-day for EBF calculations next school year. Districts planning to convert from half-day to full-day kindergarten during the 2019-2020 school year will need to pass a board resolution and provide ISBE with the minutes from the meeting at which the resolution was approved. The documents to facilitate this change should be submitted to Ethylene Ferdinand, eferdina@isbe.net. The final calculations for 2017-2018 school year mandated categorical prorations recently became available. The FY 2019 reimbursements include 80 percent for Special Education Private Facilities, 86 percent for Special Education Transportation, and 82 percent for Regular/Vocational Transportation. The reimbursements completed in FY 2018 show 100 percent reimbursement for Special Education Orphanage, 100 percent for Regular Orphanage, and 30 percent for the Illinois Free Lunch and Breakfast program. A more detailed breakdown of each program is available on the ISBE website. Nomination forms for the 2019-2020 Those Who Excel program are posted online. ISBE’s Those Who Excel honors recognize individuals who have made significant contributions to Illinois’ elementary and secondary schools. Recognition honors are presented to school board members and community volunteers, in addition to the categories of classroom teacher, school administrator/principal, student support personnel (licensed), education service personnel (unlicensed), team, and early career educator. Applications for various nominees are due June 3 and should be emailed to jseiler@isbe.net. including this Naperville event featuring attorneys from Franczek P.C. Fifty-three attendees at a February 23 workshop in Springfield learned what school leaders need to know about collective bargaining trends, including the paramount truth that bargaining for the school board is about patience, not control. That is, the statutory obligation to bargain in good faith doesn’t compel either party to agree to a proposal or require making a concession, according to presenting attorneys David J. Braun and Brandon Wright, of Miller, Tracy, Braun, Funk, & Miller, Ltd. “You don’t have to counter offers,” Braun explained. Braun and Wright were joined on the panel by two veteran collective bargaining experts who shared tips and success stories, namely Decatur SD 61 Board President Dan Oakes, and Deanne Hillman, assistant superintendent. 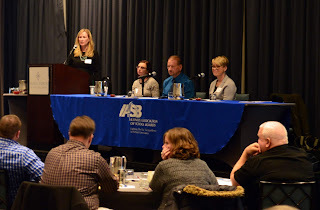 The Springfield event, one of three such regional workshops on collective bargaining hosted by IASB across the state that morning, detailed collective bargaining trends and gave participants the chance to hear from legal experts what the law requires on the subject. Shelli L. Anderson and Melissa D. Sobota of Franczek P.C. shared knowledge and experience in Naperville. Attendees learned about key issues such as language traps to avoid in bargaining and contracts. Springfield workshop presenters also covered the basics of bargaining as they explained available methodology, and shared best practice tips. Similar presentations were offered for school board members and administrators in Naperville, led by Shelli L. Anderson and Melissa D. Sobota, of Franczek P.C. ; and in Mt. Vernon, led by D. Shane Jones and Chad Watkins, of Tueth, Keeney, Cooper, Mohan &; Jackstadt, P.C. Joining the attorneys to share district success stories were Leyden CHSD 212 Board President Greg Ignoffo and Assistant Superintendent Beth Concannon in Naperville, and East Alton-Wood River CHSD 14 Superintendent John Pearson in Mt. Vernon. The Illinois State Board of Education (ISBE) has announced its new board members and new state superintendent of education, as appointed by Governor J.B. Pritzker. Carmen Ayala, Ph.D., has been named the state superintendent of education effective March 1. A 30-year educator, Ayala comes to ISBE from the superintendency at Berwyn North SD 98. She has served in administrative roles at Plainfield CCSD 202 and Community Consolidated School District 300; and East Aurora USD 131, where she also taught. She began her career at Chicago Public Schools as a teacher for five years. She served on Governor Pritzker’s education transition team before her appointment. Ayala has participated in IASB events including a presentation on prioritizing equity in-district at the 2018 Equity Event. The Office of the Governor noted that Ayala is the first woman and first person of color to serve as the permanent superintendent. Darren Reisberg, vice president for strategic initiatives and deputy provost at the University of Chicago, was named by Pritzker as chair of the State Board of Education. Susan Morrison continues on the board and was named chair of the Education Policy Planning Committee. Jane Quinlan is the new chair of the Finance and Audit Committee. Donna Simpson Leak will serve as vice chair of the board, and Cristina Pacione-Zayas as secretary of the board. Rounding out the board are Christine Benson, Cynthia Latimer, David Lett, and Jacqueline Robbins. Click here for more information from ISBE. 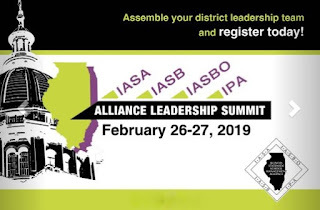 The third Alliance Leadership Summit will begin on Tuesday, February 26 and continue through Wednesday, February 27 in Springfield at the Wyndham Springfield City Centre. Hosted by the four Illinois Statewide School Management Alliance associations, IASB, Illinois Association of School Administrators (IASA), Illinois Association of School Business Officials (Illinois ASBO), and Illinois Principals Association (IPA), the two-day professional development event will provide Illinois school officials an opportunity to come together to learn and engage legislators. Dr. Jeffrey McCausland, U.S. Army colonel (retired), will be the featured speaker, delivering his presentation, “Lincoln, Strategic Vision, and Managing a Crisis” at 10:15 a.m. on Tuesday. McCausland will examine President Lincoln’s ability to formulate a strategic vision and communicate it to the nation, and how that translates to lessons for modern leaders. Also on the agenda for February 26 will be opening remarks at 10 a.m. from IASA Executive Director Dr. Brent Clark, followed by a media analysts’ panel featuring WCIA-TV’s Mark Maxwell, Associated Press political writer John O’Connor, and WUIS/NPR education reporter Dusty Rhodes. A panel titled “Focus on the Issues” presented by Alliance staff members will begin at 2:30 p.m., while IASB Executive Director Dr. Thomas Bertrand will deliver closing remarks for the first day before attendees head to a legislative reception at the State House Inn at 5 p.m.
Dr. Jason Leahy, IPA executive director, will kick off day two of the summit at 8:30 a.m., followed by a legislative panel with Senators Jason Barickman, Jennifer Bertino-Tarrant, and Andy Manar, and Representatives Terri Bryan, William Davis, and Tony McCombie. At 10:30 a.m. lobbyists from the Statewide School Management Alliance will present a panel on advocacy tips and advice before Illinois ASBO Executive Director Dr. Michael Jacoby closes out the learning portion of the Alliance Summit. Attendees will have an hour for lunch and networking before heading to the Capitol and Stratton Building for appointments with legislators. Summit registrants who plan on speaking with legislators Wednesday afternoon are encouraged to contact the offices of their state representatives prior to arrival in order to arrange meetings. Live updates from the 2019 Alliance Leadership Summit will be available on social media by using #ILedsummit19. The Illinois Statewide School Management Alliance has compiled and published its annual New School Laws publication. The 40-page booklet is meant to inform school leaders about new statutes and changes to existing laws that were passed in 2018 and took effect beginning in 2019. The document highlights 142 new laws that impact Illinois school districts. Notable changes this year include an updated oath of office for school board members, new reporting requirements for the Illinois school report card, dual credit changes, and requiring an active shooter drill with students present. New laws cover a variety of topics, including teacher recruitment, safety and security concerns, transportation issues, election law, student attendance, and numerous TIF district concerns. A total of 21 new school mandates were also put in place last year. A full list of all school mandates enacted since 1992 is available on the IASB website. Also included in this publication is Policy Reference Educational Subscription Service (PRESS) information regarding new legislation. If a new law requires action by the school board, the corresponding PRESS policy number will follow the public act information. The publication has been mailed to district superintendents, business officials, and principals, along with each school board’s president and legislative liaison. The 2019 New School Laws is also available online. On Wednesday, Governor J.B. Pritzker delivered his first budget address to the Illinois General Assembly. Predictably, Democrats in the House and Senate applauded the speech as a step in the right direction, while Republicans were concerned about the plans for additional State revenues generated through new taxes and fees. To read more about the details of the Governor’s budget address, click here. 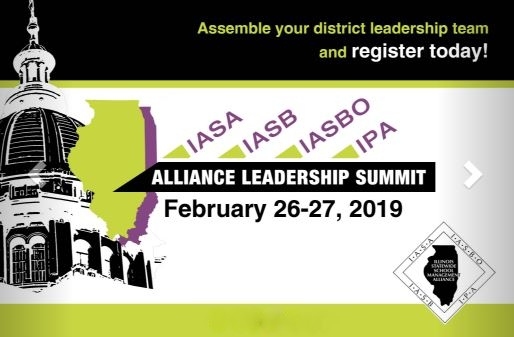 Next week in Springfield, a group of principals, school business officials, superintendents, and school board members from across Illinois will gather to advocate on behalf of their districts at the Alliance Leadership Summit. The two-day event will offer opportunities for learning, as panels of legislators and political reporters discuss the biggest issues facing Illinois public education. While there will be an abundant number of issues covered and training provided, the main focus will be on advocacy. The school leaders will be in the Capitol on Wednesday afternoon meeting with their members of the House of Representatives to share Alliance positions on legislation. Click here to read the complete Alliance Legislative Report 100-06, including bill action from last week and bills scheduled for committee next week. 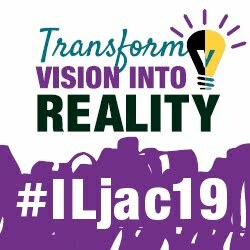 Illinois school districts have until February 22 to submit panel proposals for the 2019 Joint Annual Conference. Districts and related education organizations are invited to share their innovative programs, insights, and discoveries for this year’s “Share the Success” panel presentations. The proposals will be reviewed and evaluated by fellow school board members throughout the state. Panels not selected for Share the Success presentations may have the opportunity to present the topic during the Carousel of Panels. Districts interested in sharing their stories must submit proposals online by February 22. The 2019 Conference will take place November 22-24 in Chicago. Governor JB Pritzker delivered his first state Budget Address today before a joint session of the Illinois General Assembly. State senators and representatives joined together in the chamber of the House of Representatives to listen to the newly elected governor lay out his budget priorities. The governor’s staff has for weeks laid the ground work on just how dire state finances are. He followed that up today citing the state’s $3.2 billion budget deficit and the $15 billion backlog of unpaid bills, further claiming that he will “hold the line on spending.” He added that it will take several years to get out of the mess. However, within the parameters of his revenue and budget plan, several areas of the state budget are recommended to be increased. The governor recommends that state resources be concentrated into three main areas: education, health and human services, and public safety. Governor Pritzker pushed for adoption of a “fair tax system” – a graduated income tax instead of our current flat tax structure. Since this will require an amendment to the Illinois Constitution, Pritzker acknowledged that it will take at least 18 months to accomplish this feat. Click here to read more about the governor's budget proposal and the next steps for legislators in the budget process. Exhibitor registration for the 2019 Joint Annual Conference is now open. Click here for instructions and all exhibitor forms. Please visit the IASB website for additional information and corresponding registration and housing request forms. The forms can be downloaded as a fillable PDF; however forms cannot be submitted online. Forms will be accepted by email (registrar@iasb.com), mail, and fax. Now in its 87th year, the Joint Annual Conference has welcomed exhibitors for the past 71 years. The Conference can proudly claim vendors that have exhibited annually for 10, 20, and even 30-plus years. The event attracts thousands of public education decision-makers, connects exhibitors with them personally, and places products and services in the hands and minds of many potential customers. This year’s Conference will be held November 22-24 in Chicago. The Exhibit Hall will be open on Friday and Saturday, November 22 and 23, in the Riverside Center of the Hyatt Regency in Chicago. The next deadline for applications for a “Breakfast After the Bell” grant opportunity, offered by the No Kid Hungry organization, is March 4, 2019. Breakfast After the Bell aims to increase student participation in school breakfast, based upon research showing schoolchildren can’t learn when hungry. The Breakfast After the Bell model in Illinois follows the 2016 passage of SB 2393, now Public Act 99-0850. The No Kids Hungry organization offers grant funds supporting one of several models of breakfast delivery in which students can “grab and go,” taking breakfast to their classroom, or have breakfasts served and eaten in the classroom. Some options offer “second chance” breakfast after the first period of classes. Grant funds can be used for approved equipment, supplies, technology, and promotional materials. Examples include carts for moving food to the classrooms, or insulated bags for “grab and go,” or point-of-service technology. The food itself is not included in the grant. Applying schools must be implementing or prepared to implement a Breakfast After the Bell delivery model. A district must apply separately for each school interested. Information about the program, including a toolkit for implementation, is here. Details on the grant application are available from that page or can be obtained by clicking here. In an unusual flurry of activity for early February, the House of Representatives passed Senate Bill 1 (Lightford, D-Maywood) which increases the minimum wage across the State of Illinois to $15 dollars per hour by 2025. For more information on SB 1, click here. Governor JB Pritzker made it clear during his campaign that raising the minimum wage is a top priority. The Governor was on the House floor as members voted 69-47-1 to send the bill to his desk. SB 1 is expected to be signed into law before the Governor gives his budget speech next week. As required in the Illinois Constitution, the Governor of the State of Illinois must present a budget that details the financial outlook for Illinois. The Governor's Budget Address is scheduled for February 20, at noon. Unfortunately, as it has been in many recent years, the financial outlook at this point is negative. By most reports, the Governor is expected to describe a state looking at a $3 billion deficit with an additional backlog of bills that is nearly $15 billion. It is expected that Governor Pritzker will suggest ways for the General Assembly to change laws to increase revenues. Many of those changes could revolve around taxing items that are currently untaxed or "under" taxed, and taxing items that are currently illicit in Illinois such as sports gambling and recreational marijuana. One of the biggest policy issues Governor Pritzker campaigned on was the need for Illinois to adopt a graduated income tax. However, the Illinois Constitution states that the income tax must be at a "non-graduated rate". Even if the Constitution is successfully amended, and a graduated income tax becomes law, additional revenues from a graduated income tax would not be realized in Fiscal Year 2020. The groundwork is being laid to move Illinois in that direction for the future. Another clear message from the Governor's office in the lead up to the budget address is that they will present a transparent budget that will not rely on revenues that have been unrealized in the past. One of the main tactics used by previous administrations to present what appeared to be a balanced budget, was the sale of the James R. Thompson Center in Chicago. While the sale of the Thompson Center is still a desire of Governor Pritzker, he said he would not count the projected sale towards overall revenues. In the education transition report release by the Governor's office earlier this month, a clear emphasis was made on equitable and adequate funding. The report calls for Illinois to "aggressively" fund K-12 education with a goal of full funding by 2027. It is expected that during the Budget Address, Governor Pritzker will highlight those same issues and push for additional funding to go into the Evidence-Based Funding Model. You can watch the budget address at www.ilga.gov. After the speech, Alliance lobbyists will be reacting to the speech and taking questions on www.facebook.com/ilprincipals/. Click here to read the complete Alliance Legislative Report (101-04), including other bill action from the past week and bills scheduled for committee next week. February 14, 2019 marks one year since the Marjory Stoneman Douglas High School shooting in Parkland, Florida. Events designed to remember the victims are planned throughout the country, including memorials, moments of silence, and other peaceful demonstrations. IASB recommends that districts consult with their board attorneys when planning appropriate responses to such tragic events. Listed below are a few additional resources, all developed by NSBA’s Legal Advocacy Department, school leaders may wish to examine in regard to the related school safety concerns, preparations for possible memorials, and considerations about the regulation of student and employee speech. Note: This Blog post is solely for information purposes, not legal advice; IASB recommends that school boards consult their board attorneys on this topic.